With the 100th anniversary of the end of the First World War coming up this Sunday, I thought I would revisit some older posts related to that conflict. This one was published on November 10, 2014. It has been four years – tonight is actually the 31,220th time the ceremony has taken place. Tonight at 8, for the 29,758th time, the Last Post, the traditional salute to fallen warriors, will be played at the Menin gate in Ypres. It’s been a nightly ritual since 1928. Volunteers from the Last Post Association (and sometimes hundreds, even thousands of others) gather each evening to honour the British Empire dead of the First World War. They are there to remember, among others, those whose bodies were never recovered. 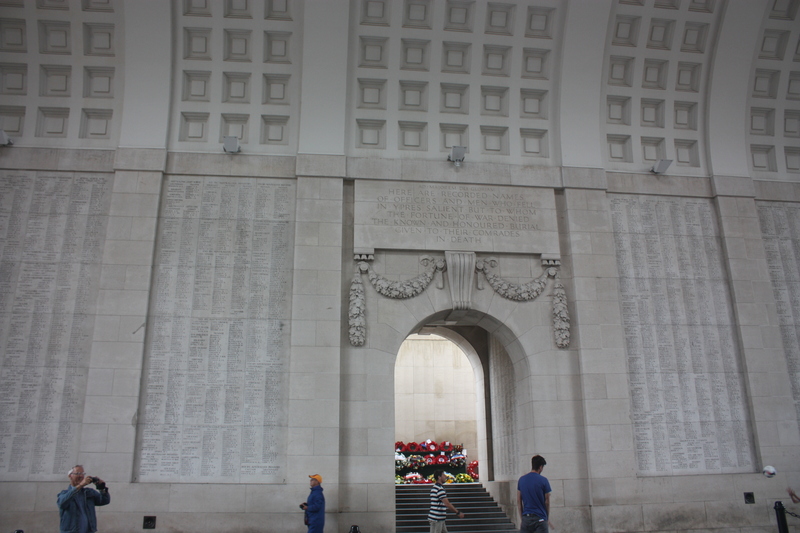 The names of 55,000 of those men are inscribed on the Menin Gate. The names of others are recorded at other area cemeteries, including Tyne Cot. I had understood that the ceremonies were to honour a different soldier each night and the plan was to continue until all those with no grave had been honoured, which would take us into the next century, but I must have misunderstood. The Last Post Society plans to continue the nightly remembrance forever (or as long as possible – whichever comes first). To the armies of the British Empire who stood here from 1914 to 1918 and to those of their dead who have no known grave. The ceremony continued from 1940-1944, the years of German occupation during the Second World War, though the location was moved, to Brookwood cemetery in England. Fighting was still going on in parts of Ypres when the Last Post service once again began being held at Menin gate. It is a sombre occasion that brings home the reality of war. Many of the men whose names are inscribed on the gate left Ypres along the same road, never to return. The gate was constructed as a memorial to them. On a regular basis others take part, school groups or church groups that make a special trip to Ypres to be part of the ceremony. A visiting school band from England marches through Ypres to Menin gate to take part in the Last Post ceremony. My first visit to the Menin Gate to observe the Last Post ceremony was especially moving. It was July 25, 2009. Earlier that day the word had circulated through the town that Harry Patch, the last surviving veteran of the Battle of Passchendaele, had died at age 111. It was the end of an era, the last connection to a time of great devastation. They had been young men full of hope and promise, so many of whom never came home. And now the last of those who had returned was gone. Crowds gather for the ceremony each night. We live in a forgetful world. History is something that happened to other people. I am glad that there are those who take time and put in the effort to remember. Lovely words. We’ve visited the Menin Gate for the last post on several occasions and it always tugs on your heartstrings and makes you think deeply about the sacrifices others made. A very special place.